Book Description: This textbook introduces aspects of the history of Canada since Confederation. “Canada” in this context includes Newfoundland and all the other parts that come to be aggregated into the Dominion after 1867. Much of this text follows thematic lines. Each chapter moves chronologically but with alternative narratives in mind. What Aboriginal accounts must we place in the foreground? Which structures (economic or social) determine the range of choices available to human agents of history? What environmental questions need to be raised to gain a more complete understanding of choices made in the past and their ramifications? This textbook introduces aspects of the history of Canada since Confederation. “Canada” in this context includes Newfoundland and all the other parts that come to be aggregated into the Dominion after 1867. Much of this text follows thematic lines. Each chapter moves chronologically but with alternative narratives in mind. What Aboriginal accounts must we place in the foreground? Which structures (economic or social) determine the range of choices available to human agents of history? What environmental questions need to be raised to gain a more complete understanding of choices made in the past and their ramifications? Each chapter is comprised of several sections and some of those are further divided. In many instances you will encounter original material that has been contributed by other university historians from across Canada who are leaders in their respective fields. They provide a diversity of voices on the subject of the nation’s history and, thus, an opportunity to experience some of the complexities of understanding and approaching the past. 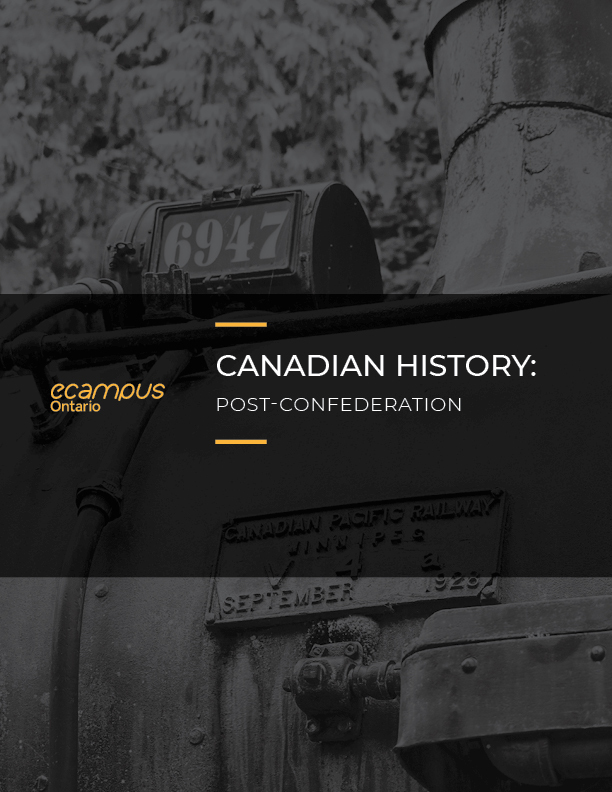 Canadian History: Post-Confederation includes Learning Objectives and Key Points in most chapter sections, intended to help identify issues of over-arching importance. Recent interviews with historians from across Canada have been captured in video clips that are embedded throughout the web version of the book. At the end of each chapter, the Summary section includes additional features: Key Terms, Short Answer Exercises, and Suggested Readings. The key terms are bolded in the text, and collected in a Glossary in the appendix. This book is a cloned version of Canadian History: Post-Confederation by John Douglas Belshaw, published using Pressbooks by BCcampus under a CC BY (Attribution) license. It may differ from the original. Canadian History: Post-Confederation by John Douglas Belshaw is licensed under a Creative Commons Attribution 4.0 International License, except where otherwise noted. Canadian History: Post-Confederation by John Douglas Belshaw is used under a CC-BY 4.0 International license. Cover image attribution: Police sports by Stuart Thomson (http://searcharchives.vancouver.ca/police-sports-finish-of-womens-foot-race) is in the public domain (https://en.wikipedia.org/wiki/Public_domain). Cover caption: The winner crosses the finish line at a 1915 “sports day” organized by the Vancouver Police Department. Photo by Stuart Thomson, City of Vancouver Archives 99-1073.